The undersigned engineers, some of whom have been engaged for a series of years in investigating the subject ot a tunnel between France and England, having attentively considered those investigations and the facts which they have developed, beg to report thereon jointly for the information of the committee. These investigations supported the theory that the Straits of Dover were not opened by a sudden disruption of the earth at that point, but had been produced naturally and slowly by the gradual washing away of the upper chalk; that the geological formations beneath the Straits remained in the original order of their deposit, and were identical with the formations of the two shores, and were, in fact. the continuation of those formations. Mr Low proposed to dispense entirely with shafts in the sea, and to commence the work by sinking pits on each shore, driving thence, in the first place, two small parallel driftways or galleries from each country, connected at intervals by transverse driftways. By this means the air could be made to circulate as in ordinary coal mines, and the ventilation be kept perfect at the face of the workings. Mr Low laid his plans before the Emperor of the French in April, 1867, and in accordance with the desire of his Majesty, a committee of French and English gentlemen was formed in furtherance of the project. For some years past Mr Hawkshaw's attention has been directed to this subject, and ultimately he was let to test the question, and to ascertain by elaborate investigations whether a submarine tunnel to unite the railways of Great Britain with those of France and the Continent of Europe was practicable. Accordingly, at the beginning of the year 1866, a boring was commenced at St.Margaret's Bay, near the South Foreland; and in March 1866, another boring was commenced on the French coast, at a point about three miles westward of Calais; and simultaneously with these borings an examiniation was carried on of that portion of the bottom of the Channel lying between the chalk cliffs on each shore. 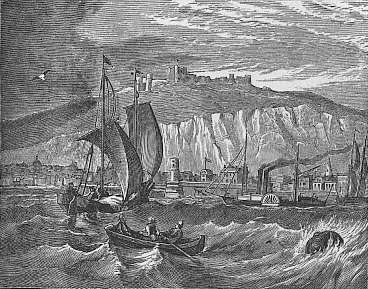 The principal practical and useful results that the borings have determined are that on the proposed line of the tunnel the depth of the chalk on the English coast is 470 ft. below high water, consisting of 175 ft. of upper or white chalk and 295 ft. of lower or grey chalk; and that on the French coast the depth of the chalk is 750 ft. below high water, consisting of 270 ft. of upper or white chalk and 470 ft. of lower or grey chalk; and that the position of the chalk on the bed of the Channel, ascertained from the examination, nearly corresponds with that which the geological inquiry elicited. In respect to the execution of the work itself, we consider it proper to drive preliminary driftways or headings under the Channel, the ventilation of which would be accomplished by some of the usual modes adopted in the best coal mines. As respects the work itself, the tunnel might be of ordinary form, and sufficiently large for two lines of railway, and to admit of being worked by locomotive engines, and artificial ventilation could be applied; or it might be deemed advisable, on subsequent considerations, to adopt two single lines of tunnel. The desirability of adopting other modes of traction may be left for future consideration. Such are the essential passages of the report which, in 1868, was submitted to the Government of the Emperor Louis Napoleon, and was made the subject of a special commission appointed by the Emperor to inquite into the subject in all its bearings. The commission presented its report in 1869, and these are the chief conclusions contained in it. Are of opinion that driving a submarine tunnel in the lower part of this chalk is an undertaking which presents reasonable chances of success. Nevertheless they would not hide from themselves the fact that its execution is subject to contingencies which may render success impossible. II. These contingencies may be included under two heads: either in meeting with ground particularly treacherous - a circumstance which the known character of the grey chalk renders improbable; or in an influx of water in a quantity too great to be mastered, and which might find its way in either by infiltration along the plane of the beds, or through cracks crossing the body of the chalk. Apart from these contingencies, the work of excavation in a soft rock like grey chalk appears to be relatively easy and rapid; and the execution of a tunnel, under the conditions of the project, is but a matter of time and money. III. In the actual state of things, and the preparatory investigations being too incomplete to serve as a basis of calculation, the commission will not fix on any figure of expense or the probable time which the execution of the permanent works would require. The chart, Fig.185, and the section, Fig.186, will give an idea of the course of the proposed tunnel, which will connect the two countries almost at the nearest points. The depth of the water in the Channel along the proposed line nowhere exceeds 180 ft. - little more than half the height of St.Paul's Cathedral, which building would, therefore, if sunk in the midst of the Channel, still form a conspicuous object rising far above the waves. But the tunnel will pass through strata at least 200 ft. below the bottom of the Channel, rising towards each end with a moderate gradient; and from the lower points of these inclines the tunnel will rise slightly with a slope of 1 in 2,640 to the centre, or just sufficient for the purposes of drainage. On the completion of the tunnel a double line of rails will be laid down in it, and trains will run direct from Dover to Calais. Companies have already been formed in England under the presidency of Lord Richard Grosvenor, and in France under that of M.Michel Chevalier, and the legislation of each country has sanctioned the exercise. Verily the real magician of our times is the engineer, who, by virtually abolishing space, time, and tide, is able to transport us hither and thither, not merely one or two - almost like the magicians we read of in the "Arabian Nights," with their encharted horses or wonderful carpets - but by hundreds and by tens of hundreds. "This long-debated project has at length emerged from the region of speculation, and is entering the stage of practical experiment. On this side of the Channel a company has been formed to carry out the work, and on the other side the French Minister of Public Works has presented to the Assembly a Bill authorizing a French company to co-operate with the English engineers. The enterprise is one worthy of the nations which have in the present generation joined the two shores of the Atlantic by an electric cable, and cut a ship canal through the Isthmus of Suez, and of the age which has obliterated the old barrier of the Alps. All these gigantic undertakings seems almost as bold in conception and as difficult of execution as the great work now about to commence. Those twenty miles of sea have long been crossed by telegraph lines; they will soon be bridged, as it were, by splendid steamers; but even our own generation, accustomed as it is to gigantic engineering works, has scarcely regarded the construction of a railway underneath the waves as within the reach of possibility. M.Thome de Gamond, who first made the suggestion five and thirty years ago, was long regarded as an over-sanguine person, who did not recognise the inevitable limits of human skill and power. A tunnel under twenty miles of stormy sea seemed very much like and engineer's dream, and it is only within the last few years that it has been regarded as a feasible project. Of its possibility, however, there seems now to be no manner of doubt. It is merely a steam of sea-water, and not a fissure in the earth, which divides us from the Continent. Prince Metternich was right in speaking of it as a ditch. The depth is nowhere greater than one hundred and eighty feet; and so far as careful soundings can ascertain the condition of the soil underneath the water, it consists of a smooth unbroken bed of chalk. The success of the experiment depends on this bed of chalk being continuous and whole. Should any very deep fissure exist, which is extremely improbable, the tunnel may probably not be driven through it. But given, what every indication shows to exist, a homogenous chalk bed some hundreds of feet in thickness, te driving of a huge bore for twenty miles through it is a mere question of time, money, and organization, and as the engineers have these resources at their command, they are sanguine, and we may even say confident, of success. "The method by which it is proposed that the excavation shall be made is in some respects similar to that which was successfully employed in tunnelling the Alps. Mont Cenis was pierced by machinery adapted to the cutting of hard rock; the chalk strata under the Channel are to be bored by and engine, invented by Mr Dickenson Brunton, which works in the comparatively soft strata like a carpenter's auger. A beginning will be made simultaneously on both sides of the Channel, and the effort will at first be limited to what we may describe as making a clear hole through from end to end. This small bore, or driftway as it is called, will be some seven or nine feet in diameter. If such a communication can be successfully made, the enlargement will be comparatively easy. Mr Brunton's machine is said to cut through the chalk at the rate of a yard an hour. We believe that those which were used in the Mont Cenis Tunnel cut less than a yard a day of the hard rock of the mountain. Two years, therefore, ought to be sufficient to allow the workers from one end to shake hands with those from the other side. The enlargement of the driftway into the completed tunnel would take four years' more labour and as many millions of money. The millions, however, will easily be raised if the driftway is made, since the victory will be won as soon as the two headways meet under the sea. One of the great difficulties of the work is shared with the Mont Cenis Tunnel, the other is peculiar to the present undertaking. The Alps above the one, and the sea above the other, necessarily prevent the use of shafts. The work must be carried on from each end; and all the debris excavated must be brought back the whole length of the boring, and all the air to be breathed by the workmen must be forced in. The provision of a fit atmosphere is a mere matter of detail. In the great Italian tunnel the machines were moved by compressed air, which, being liberated when it had done its work, suppled the lungs of the workers with fresh oxygen. The Alpine engineers, however, started from the level of the earth: the main difficulty of the Submarine Tunnel seems to be that it must have its starting-point at each end the bottom of a huge well more than a hundred yards in depth. The Thames Tunnel, it will be remembered, was approached, in the days when it was a show place, by a similar shaft, though of comparatively insignificant depth. This enterprise may indeed be said to bear something like the relation to the engineering and mechanical skill of the present day which Brunel's great undertaking bore to the powers of an age which looked on the Thames Tunnel as the eighth wonder of the world. Probably the danger which will be incurred in realizing the larger scheme is less than that which Brunel's workmen faced. "It is, of course, impossible for any estimate to be formed of the risks of this enormous work. They have been reduced to a minimum by the mechanical appliances now at our disposal, but they are necessarily considerable. The tunnel is to run, as we understand, in the lower chalk, and there will be, as M.de Lesseps told the French Academy, some fifty yards of soil - a solid bed of chalk, it is hoped - between the sea-water and the crown of the arch. Moreover, an experimental half-mile is to be taken on each side before the work is finally begun; the engineers, in fact, will not start on the journey till they have made a fair trial of the way. Altogether the beginning seems to us to be about to be made with a combination of caution and boldness which deserves success, even though it should be unable to command it. Unforeseen difficulties may arise to thwart the plans, but the enterprise, so far, is full of promise. The opening of such a communication between this country and the Continent will be a pure gain to the commercial and social interests on both sides. It obliterates the Channel so far as it hinders direct communication, yet keeps it intact for all those advantages of severance from the political complications of the Continent, which no generation has more thoroughly appreciated than our own. The commercial advantages of the communication must necessarily be beyond all calculation. A link between the two chief capitals of Western Europe, which should annex our railway system to the whole of the railways of the Continent, would practically widen the world to pleasure and travel and every kind of enterprise. The 300,000 travellers who cross the Channel every year would probably become three millions if the sea were practically taken out of the way by a safe and quick communication under it. The journey to Paris would be very little more than that from London to Liverpool. It is, however, quite needless to enlarge on these advantages. The Channel Tunnel is the crowning enterprise of an age of vast engineering works. Its accomplishment is to be desired from every point of view, and, should it be successful, it will be as beneficent in its results as the other great triumphs of the science of our time."